Our firefighters are supremely dedicated to their communities and regularly put their lives at risk to save others. We owe it to all our firefighters to ensure they receive the training they need to meet new and existing challenges as they protect our families. I want to thank the Fire Services Coalition for their help in this effort to improve our state firefighter training standards, which have not been updated in more than 30 years. My legislation to update Michigan’s firefighter training standards is on its way to the governor to be signed. Midland Fire Department Chief Chris Coughlin testified in support of the bills. Coughlin represents the Michigan Association of Fire Chiefs, which is one of the groups in the Fire Services Coalition. The other organizations include the Michigan Professional Fire Fighters Union, Michigan Fire Inspectors Society, Michigan Fire Service Instructors and the Michigan State Firemen’s Association. Senate Bill 264 would improve firefighter training standards while leaving in place the ability to take into account the vast differences in the ways our fire services are provided across the state. The bill would ensure clear definitions and roles for all aspects of fire service training and also increase the membership of the Fire Fighters Training Council (FFTC) from seven to nine members. 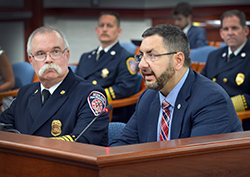 SB 265 would allow the FFTC the flexibility to fully utilize the funding for firefighter training made available through the fireworks safety fee assessed on the sale of all fireworks in Michigan. This legislation is designed to enable firefighting experts to ensure that every Michigan resident continues to have trained men and women ready to come to their aid and respond in fire emergencies. As part of that effort, these bills will allow the FFTC to develop rules and certification for specialized areas of fire service.